Home » Blogs » info@bookculture.com's blog » Queer Book Club reads YA! Book Culture on Columbus is proud to host the Queer Book Club, which meets on the second Sunday of every month at 5pm to discuss queer fiction, nonfiction and poetry titles. Past books include Edmund White's A Boy's Own Story, Djuna Barnes' Nightwood, and Ocean Vuong's Night Sky With Exit Wounds. The book club is excited to announce that, come September, they'll be adding Young Adult titles to the mix! 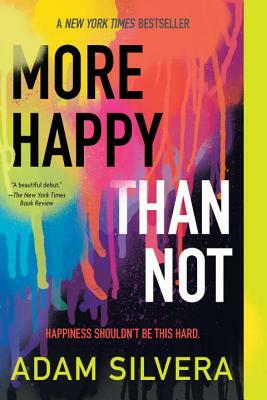 On September 10th, QBC will be meeting to discuss its very first YA title, More Happy Than Not by Adam Silvera. Our own Josh has already read this "twisty, gritty, profoundly moving" debut and says that "this is the perfect novel for anyone, not just LGBT people, but for anyone on a journey to find happiness. A reminder to everyone how important our memories are and how the past shapes our present and future." We hope you'll join us! As always, all are welcome to attend, LGBT-identifying or otherwise. Discussion is expected to run for about an hour, and may include extension into contemporary issues surrounding LGBT-identifying people. This space may also be used to discuss LGBT activism and opportunities to engage social actions. Respectful, invitational dialogue is expected of all participants. Contact the book club with any questions at queerbc@bookculture.com.